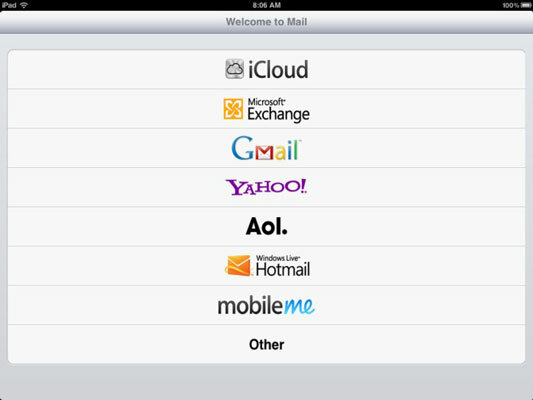 If you have no e-mail accounts on your iPad, the first time you launch Mail, you see the Welcome to Mail screen, shown in the figure. Your choices are iCloud, Microsoft Exchange (business e-mail), Gmail, Yahoo!, AOL, Microsoft Hotmail, MobileMe, and Other. 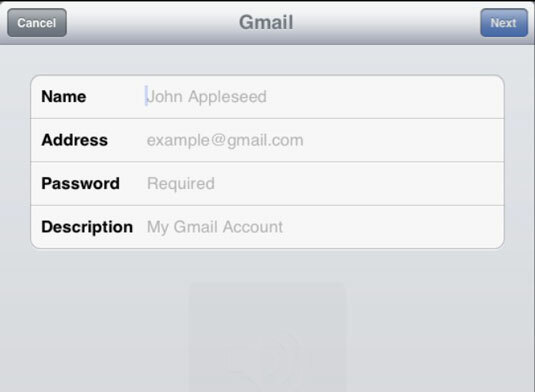 If you have one or more e-mail accounts on your iPad already, and want to add a new account manually, tap Settings on the Home screen and then tap Mail, Contacts, Calendars→Add Account. You see an Add Account screen with the same account options that are shown on the Welcome to Mail screen. Proceed to one of the next three sections, depending on the type of e-mail account you selected. Tap the appropriate button on the Welcome to Mail screen. Enter your name, e-mail address, password, and optional description, as shown. You’re finished. That’s all there is to setting up your account. On June 30, 2012, Apple completes the transition from MobileMe to iCloud. Apple says that if you had an active MobileMe account when you signed up for iCloud, you can keep your me.com or mac.com e-mail address and any e-mail aliases you have created. You can move your MobileMe mail to iCloud, and for that matter, you can move your MobileMe contacts, calendars, and bookmarks.